You can add rounded corners to a column background or border or a photo. The CSS rule applies to the <img> tag, so the photos can be placed in any module as long as they are converted to <img> in the HTML. 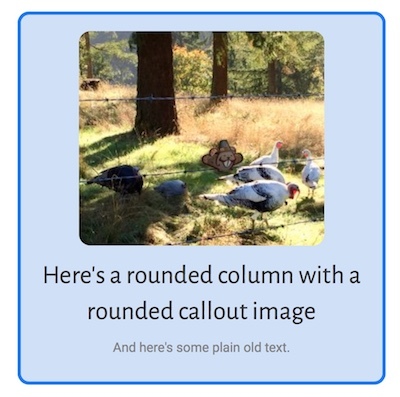 The following screenshot shows both rounded column corners and rounded corners for the image in a Callout module. Tip: you can add other effects to photos, such as cropping them into a circle, in the Photo or Callout module. Click the Crop list on the General tab of the Photo module or the Image tab of the Callout module and choose a cropping option. Open the column or module for editing. If it's a column, ensure you've assigned a border or a background color on the Style tab. Click the Advanced tab and scroll down to the HTML Element section (Page Builder 2.x) or CSS Selectors section (Page Builder 1.x). Enter a name in the Class field. Save the column or module settings and repeat this step for every item that you want to have a rounded corner. Add one or both of the CSS rules below, depending on whether you want rounded corners on columns, photos, or both. There are several places you can add CSS. See the Related Article below about where to put custom CSS code. Replace the class name with your custom class name, and increase the number of pixels for border-radius if you want rounder corners.